The player arrives in the fictional city of Rockport with a racing version of the BMW M3 GTR. Following Mia Townsend (played by Josie Maran), the player proves his driving prowess as he is pursued by a veteran police officer named Sergeant Cross, who vows to take down the player and end street racing in Rockport. Races seem to be in the player's favor until a particular group of racers, led by the game's antagonist, Clarence Razor Callahan (played by Derek Hamilton), sabotage and seize the player's car. Without a car to escape in, the player is arrested by Cross, but is later released due to lack of evidence. Mia picks up the player and then informs the player about Razor's new status on the Blacklist, a group of 15 drivers most wanted by the Rockport Police Department. She then helps by assisting the player in acquiring a new car and working his way up the Blacklist. Rivals are defeated one by one, and the player is rewarded with reputation, new rides, and ride improvements with every Blacklist member taken down. As new boroughs are opened up throughout Rockport (Rosewood, Camden Beach, and Downtown Rockport), Mia also sets up safehouses for the player to lie low in, in exchange for placement of "side bets" on the player's races. The final challenge for the #1 spot on the Blacklist pits the player in a race against Razor, with the player emerging as the victor, thus reclaiming the BMW. When Razor refuses to relinquish ownership of the car and attacks Mia after she confiscates the keys from Razor, she subdues him, while revealing herself to be an undercover officer. Mia throws the keys to the player, and tells him to escape the incoming police force. Razor is taken into custody and the player is pursued by the entire Rockport Police Department under the command of Cross. The player manages to slip away from Cross and abandons Rockport City by launching the BMW over an old incomplete bridge that Mia points out to the player in her last phone call. After the player's escape, Cross brings up the player's rap sheet and adds him to the National Most Wanted List. In addition to Razor, the entire Blacklist is arrested with the "help" of the player. Need for Speed: Carbon's storyline acts as a sequel, set at an undetermined time just after Most Wanted. 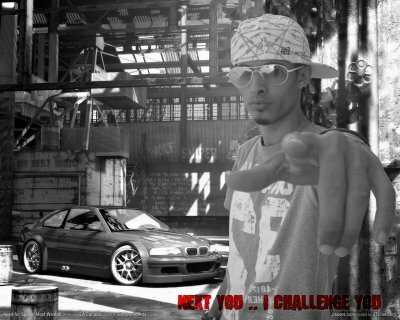 la bmw ta3ek yek j t di stationiha b3id hh?? ?